We’d love your help. Let us know what’s wrong with this preview of Samantha Sanderson At the Movies by Robin Caroll. It seemed like the per Sam Sanderson is an independent, resourceful, high-tech cheerleader. She dreams of becoming an award-winning journalist like her mother, and so she’s always looking for articles she can publish in her middle-school paper (where she secretly hopes to become editor). And with a police officer for a father, Sam is in no short supply for writing material. To ask other readers questions about Samantha Sanderson At the Movies, please sign up. What is Makayla's last name, and is she in 8th grade or 7th grade? How does this book, or any of the Samantha Sanderson books, deal with atheists or non-Christians? Is it respectful towards other perspectives and religions? Is Samantha's goal to convert non-Christians? Mostly, this was a fun whodunit featuring a likable heroine. Series: Book #1 in the “Samantha Sanderson” series, which is part of the “Faithgirlz” line. Spiritual Content- 1 Timothy 4:12 is written on Sam’s Youth Group’s wall; Proverbs 22:11 and a few other Scriptures are written; Sam learns how to witness to her friend without forcing her Faith on her; Prayers are said and Sam & Makayla tell each other people they need to pray for; Sam & Makayla go to Youth Group. I truly liked this book! When I first saw the cover I wasn’t so sure about it (You’d think I’d learn not to judge a book by it’s cover by now! )…the girls seemed a bit odd on the front cover but when I read the back cover—what the story was about—I thought it might be like “God’s Not Dead” (a fantastic movie, if you haven’t seen it you need to!). While reading it I relized it really isn’t like “God’s Not Dead” but a great storyline regardless. I knew I had hear of the author, Robin Caroll, after looking on my bookshelf that has some of my Pre & Teen books, I found them! The “Rock Harbor Search and Rescue” series written with Colleen Coble. (Book #1’s, “Rock Harbor Search and Rescue”, review here! Book #2’s I have not posted yet but did read.) I can really see the writing similarities between this series and that series, but I liked this Book #1 in this series more than “Rock Harbor Search and Rescue”, which is book #1 in that series. I really liked “Samantha Sanderson at the Movies” and can’t wait to read book #2, “Samantha Sanderson on the Scene”. Samantha "Sam" Sanderson dreams of becoming a journalist like her mother. When there is a bomb scare at her local movie theater, Sam finally has the lead on a story for her middle-school newspaper, where she hopes to eventually become chief editor. She thinks this is a story that will help get her there. But the theories and suspicions that Sam writes about of who may have placed the bomb make some people angry and may put Sam in danger. Can Sam solve the mystery? I really liked “Samantha Sanders Samantha "Sam" Sanderson dreams of becoming a journalist like her mother. When there is a bomb scare at her local movie theater, Sam finally has the lead on a story for her middle-school newspaper, where she hopes to eventually become chief editor. She thinks this is a story that will help get her there. But the theories and suspicions that Sam writes about of who may have placed the bomb make some people angry and may put Sam in danger. Can Sam solve the mystery? I really liked “Samantha Sanderson at the Movies”, the first book in the Faithgirlz: Samantha Sanderson series. It is a well written mystery book for girls that had me guessing until the end. Sam learns some good lessons the hard way about how to be a good journalist and about not betraying someone’s trust. Sam is a Christian in the book. She goes to youth group at her church and she prays at different times in the story. She also witnesses to her friend. 1 Timothy 4:12 and Proverbs 22:11 are quoted in the book. Sam and her friend Makayla do some questionable things in this book, however, that I think parents and adults should be aware of. While at school, Makayla hacks past the school’s firewall in order for the girls to look up something on the internet. Sam also eavesdrops a few times in the story (although it usually started out as an accident) and she doesn’t always do what her dad tells her to do. Samantha Sanderson At the Movies by Robin Caroll was provided to me through the BookSneeze program and Zonderkidz Publishers in exchange for an honest review. This book is part of the FaiThGirLz! series but still would be enjoyed by middle school boys as well. Samantha Sanderson, or Sam, wants to be a journalist like her mom. She writes for the school newspaper but the editor, Aubrey, doesn't want her on the paper staff. However, when Sam finds a hidden bomb at the movie theater, she is sure she Samantha Sanderson At the Movies by Robin Caroll was provided to me through the BookSneeze program and Zonderkidz Publishers in exchange for an honest review. This book is part of the FaiThGirLz! series but still would be enjoyed by middle school boys as well. Samantha Sanderson, or Sam, wants to be a journalist like her mom. She writes for the school newspaper but the editor, Aubrey, doesn't want her on the paper staff. However, when Sam finds a hidden bomb at the movie theater, she is sure she has a good enough story to show Aubrey she is deserving of a good roll on the newspaper staff. What will happen now? Was the bomb planted by an atheist because a church was renting out the theater to show a Christian movie? Can Sam balance all of this detective work and newspaper writing with school and cheerleading? And what happens when Sam publishes "ideas" about the bombing instead of facts? Could this affect her roll on the newspaper? Or her dad's job as police detective? Should she listen to her dad and step down from writing about this story? And what about her friend who isn't a Christian? How can she witness to her without forcing Jesus down her throat? Excellent book aimed at the middle school population - boys or girls. I have loved this series! The books in this series, so far three, are great for Christian girls. A little different than I thought it would be, but very good and intriguing. It made me want to keep reading. I’m going to admit it’s hard for me to read and write a review on a book that is geared toward the pre-teen age however I requested this book as I knew my daughters would probably like it and since it’s hard to find Christian fiction books at the libraries we frequent I thought it would be good to request this one. I really thought Sam was a bit annoying (even my 12 year old thought the same thing) constantly eavesdropping in the name of ‘good reporting’ and not respecting other peoples privacy I’m going to admit it’s hard for me to read and write a review on a book that is geared toward the pre-teen age however I requested this book as I knew my daughters would probably like it and since it’s hard to find Christian fiction books at the libraries we frequent I thought it would be good to request this one. I really thought Sam was a bit annoying (even my 12 year old thought the same thing) constantly eavesdropping in the name of ‘good reporting’ and not respecting other peoples privacy and then when she’d get called on it try to excuse her behavior. I kept waiting for her teacher, her dad and even the Principal to give her some consequence besides removing her article from the school’s newspaper blog – but ultimately it seemed most of the adults looked the other way – and mom is a journalist who seems to be traveling more than being a mom. So that said, the pace of the book was great and the suspense in trying to find who planted the explosive device and why was a great plot line and one that even this adult enjoyed. The book is typical of what middle school is like in a regular school with talks of crushes and who is cute as well as the constant “she doesn’t like me” and “she doesn’t like her” laments – I get it, I remember my high school and middle school days but it did grow sort of old. There is one mention of homeschooling and how it turns Makayla’s mom into some sort of homework police because a mom who homeschools and has a child in Makayla’s martial arts class made a comment about how public school students score lower on tests. Really? It didn’t add anything to the book and it almost seemed like a dig at homeschoolers – maybe the mom could have been concerned about homework because she wanted her daughter to end middle school on a good note – why blame a homeschool mom? Even with my two concerns about the book, I didn’t have a problem letting my 12 year old read as well, she is well grounded in what we do and don’t allow and is also secure in the fact she is homeschooled so that being said we both are or did enjoy the book. The plot was great and kept the book going and towards the end I was cheering for Sam’s dad who did tell the Principal that Sam needed removed from the story and the reporting of it, although fellow students lauded her on the blog after the case was solved, here is hoping that Sam learns her lesson about what is ‘good reporting’ and eavesdropping isn’t the way to get a good story in the next book in the series. One really positive thing though is that Sam makes no apologies about her love of Jesus and going to church and she longs to share Him with her classmate who tells her that she isn’t a Christian, so I really appreciated that aspect of the book – the faith theme runs through out the entire book – which is what made it most enjoyable for me. Sam Sanderson is an independent, resourceful, high-tech cheerleader. She dreams of becoming an award-winning journalist like her mother, and so she s always looking for articles she can publish in her middle-school paper (where she secretly hopes to become editor). And with a police officer for a father, Sam is in no short supply for writing material. It seemed like the perfect opportunity. When an explosive device is found in the local theater, Sam gets the lead on this developing and controversial story---controversial because the movie theater has recently come under attack by a renowned, outspoken atheist for allowing a local church to show Christian movies. Sam s police-officer father happens to be heading the investigation, and Sam can t resist doing some sleuthing of her own with the help of her best friend Makayla s techno-genius. But when Sam s theories end up being printed in the school paper, she lands in big trouble---and danger!" Sam was just watching a new children's based movie and now there is word of a an active bomb in the theater she is attending. The whole time all she can think about is, who would do this? When a rumor surfaces, she must find the truth---she has to because she is reporting the story for the school newspaper. If this isn't enough, she finds out that her father is sent in to help the bomb unit, to disengage the bomb. She is so afraid for her father but at the same time she must get to the bottom of this whole fiasco. But is this something that can be achieved without Sam getting into hurt or at the very least into trouble by snooping. But soon someone reports her findings to the school paper. This is the first book in a teen series by Robin Caroll that seems to fit the bill! My daughter loves it and plans to read the next book in the series. Samantha Sanderson knows that there is only ONE way she can become editor of her school's newspaper and eventually become an international reporting superstar -- just like her mother. Someone has left a BOMB at the local movie theatre --- and Samantha is finding clues and suspects everywhere Samantha Sanderson knows that there is only ONE way she can become editor of her school's newspaper and eventually become an international reporting superstar -- just like her mother. Someone has left a BOMB at the local movie theatre --- and Samantha is finding clues and suspects everywhere she goes. But while Samantha works hard to carefully word her stories without placing actual blame on any one individual, her father begs Samantha to drop the story -- primarily because *he* is the one who is really in charge of the investigation, and he can't have his daughter getting too close to danger (or jeopardizing his job). Can Samantha find her big break and deliver a winning news story without losing her father's trust and respect in the process? 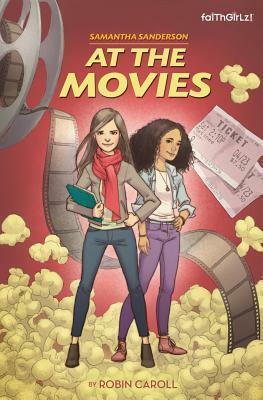 SAMANTHA SANDERSON AT THE MOVIES is an adorably cute and fun middle grade novel, geared primarily towards middle school girls who adopt the Christian faith. Samantha learns some wholesome lessons along the way -- like respecting her parents, sharing the message of her faith, and abstaining from harmful gossip, to name a few. But, beyond the good moral lessons, I think this novel provided a very entertaining plot line that young readers will likely find both entertaining and empowering. Samantha is an awesome role model for young girls, as she demonstrates self-confidence and persistence while working towards her goals, something that parents should appreciate. This is book aimed at younger readers, I'd say middle school age (the main character is in 7th grade). I think it's a great new series for girls to read about a strong, smart girl who loves God and has good goals for her future. "Sam" wants to be a reporter like her mom when she is older; For now, she writes for the middle school paper and when she and her best friend are at the movies and help discover a bomb, she gets herself assigned to the story. She investigates on her own, writes her concl This is book aimed at younger readers, I'd say middle school age (the main character is in 7th grade). I think it's a great new series for girls to read about a strong, smart girl who loves God and has good goals for her future. "Sam" wants to be a reporter like her mom when she is older; For now, she writes for the middle school paper and when she and her best friend are at the movies and help discover a bomb, she gets herself assigned to the story. She investigates on her own, writes her conclusions and has to deal with the consequences of her stories, both good and bad. Her dad is the detective in charge of the case, and the story tells of the dynamics between them as well, as she tries to get the scoop for the paper. I love how the mystery is interesting and engaging but there are also other great side stories as well. When one of Sam's friends reveals that she knows about God but doesn't believe in Him, Sam is confused and goes to her sunday school teacher for help on how to reach her friend. Through the story, the readers get great advice on planting seeds and being patient. Sam also has to figure out how to fix her relationship with her dad when he feels she has betrayed his trust by pursuing a story he told her in confidence. I'd wholeheartedly recommend this book for young girls and will definitely be saving this one for my daughter when she's a little older! It was definitely a great well-written book with great teaching about faith. Sam is a "scoop" artist. With a father as an investigative detective and the added opportunity for Sam to be the lead "reporter" for the school's blog... well you know that Sam will get herself in and out of some "murderous" situations. Many of which is putting pressure on her father and unnerving some students who would like to see her blog "crash and burn." Sam knows that this blog could get her into the running for being the editor next year, so she convinces her father to let her blog the fa Sam is a "scoop" artist. With a father as an investigative detective and the added opportunity for Sam to be the lead "reporter" for the school's blog... well you know that Sam will get herself in and out of some "murderous" situations. Many of which is putting pressure on her father and unnerving some students who would like to see her blog "crash and burn." Sam knows that this blog could get her into the running for being the editor next year, so she convinces her father to let her blog the facts. The challenge for Sam will be stating the truth and not prejudging what she perceives as the truth. "...that the fear of the Lord that's talked about in Scripture is a reverent fear and awe, not a scared-of-the-boogeyman type of fear." "Reporter's shouldn't editorialize or sensationalize... just report the facts." Can Sam report just the facts and leave out the investigative truths that are coming together like pieces in a puzzle? As a field reporter, her mother warns her to be very careful "...Even most journalists don't truly have a grasp on freedom of speech." Sam's reporting steps on toes, creates many headaches for the school's principal, causes her father to make some decisions that he doesn't want to make... and in the end, helps Sam to weigh "how" to report without hurting those she is talking about. OK so this book I actually got because I thought it would be really neat, seeing as I teach middle school, to have one of my middle school girls read it to see what their thoughts were. So I did. She said that she liked the book but not necessarily for girls her age. She thought that is was written in a way that would probably be more appealing to younger audiences. She thought that maybe a 5th or 6th grader might like it more. After reading it myself I completely agree with her. I thought becaus OK so this book I actually got because I thought it would be really neat, seeing as I teach middle school, to have one of my middle school girls read it to see what their thoughts were. So I did. She said that she liked the book but not necessarily for girls her age. She thought that is was written in a way that would probably be more appealing to younger audiences. She thought that maybe a 5th or 6th grader might like it more. After reading it myself I completely agree with her. I thought because Sam herself is in middle school that it would be geared more for my girls ages (7th or 8th) but it is definitely more suited for 5th or 6th. Only because the way she writes and the words she uses are just on the younger side. So if you have a tween I think this is more up their alley. Now not all tweens and teens are the same so you can make a judgment call on this one based on what your child likes to read and his or her reading level. This is a great book for young people. I have a home preschool and at nap time I read a chapter from a chapter book each day. We read through At The Movies at the end of the school year. I had several children graduating, five going to kindergarten and one going to first grade. They enjoyed me reading it, but part of it were a bit over their heads. I recommend a little older. My 13 year old was also in the room while we read and she enjoyed the story. It was very well done. It kept you thinking This is a great book for young people. I have a home preschool and at nap time I read a chapter from a chapter book each day. We read through At The Movies at the end of the school year. I had several children graduating, five going to kindergarten and one going to first grade. They enjoyed me reading it, but part of it were a bit over their heads. I recommend a little older. My 13 year old was also in the room while we read and she enjoyed the story. It was very well done. It kept you thinking about different possibilities for who did it. It also went into some basic faith questions that children and preteens might ask themselves and their friends. This book had great answers. I believe it guided the reader to think deeper into what they believe and why. I loved the relationship between her and her parents. It was one of honestly and respect. They had arguments and didn't agree on everything but they listened to each other and worked it out. I recommend this series to preteen and young teens. Great reading. It is so rare to find good inspirational fiction for pre-teen girls; thankfully Robin Carroll has started to close the gap with her recently released Samantha Sanderson series. "At the Movies" was filled with light suspense and realistic middle school conversations and scenarios that are sure to attract the young adult audience. When a local theater is threatened with a bomb, Samantha Sanderson uses her school paper and her local connections to scoop out the case. It doesn't hurt that her mother It is so rare to find good inspirational fiction for pre-teen girls; thankfully Robin Carroll has started to close the gap with her recently released Samantha Sanderson series. 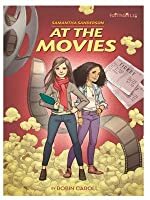 "At the Movies" was filled with light suspense and realistic middle school conversations and scenarios that are sure to attract the young adult audience. When a local theater is threatened with a bomb, Samantha Sanderson uses her school paper and her local connections to scoop out the case. It doesn't hurt that her mother is a renowned journalist and her father is a local law enforcement officer. But will Samantha's exaggerated curiosity burn too many bridges between her family and friends? Fortunately, this case gets solved through a chance observation and a quick photo on a phone. It will be fun to see what other adventures await Samantha and her best friends in "On The Scene"! I absolutely love this book. It’s perfect for tweens and young adults alike. I planned on reading this with my cousin and we’d do a review together, but she had other pressing matters. I got dumped for choir practice and Bible study and I am not mad. However, I did pass the book along to her to read. I just know that she will love it! Samantha is one cool girl. She wants to be a journalist and what better way to start off than the school paper. She finds a hidden bomb at the movie theater and su I absolutely love this book. It’s perfect for tweens and young adults alike. I planned on reading this with my cousin and we’d do a review together, but she had other pressing matters. I got dumped for choir practice and Bible study and I am not mad. However, I did pass the book along to her to read. I just know that she will love it! Samantha is one cool girl. She wants to be a journalist and what better way to start off than the school paper. She finds a hidden bomb at the movie theater and suddenly she becomes a detective, out to find out who planted the bomb and why. She also plans to show Aubrey, the paper’s editor, that she has what it takes to be on the paper. Can she balance all that she has to do and get the job done? Robin Caroll may be most well-known by fans of Christian fiction for her books that are tense, fast-paced, and full of mystery. This is a much-toned down version of those novels written for tween girls as part of the FaithGirlz series of books published by Zonderkidz. Sam Sanderson wants to be an investigative journalist more than anything and she sees the opportunity to make her name a household one when she gets the chance to write a series of articles for her school newspaper. When a bomb is f Robin Caroll may be most well-known by fans of Christian fiction for her books that are tense, fast-paced, and full of mystery. This is a much-toned down version of those novels written for tween girls as part of the FaithGirlz series of books published by Zonderkidz. Sam Sanderson wants to be an investigative journalist more than anything and she sees the opportunity to make her name a household one when she gets the chance to write a series of articles for her school newspaper. When a bomb is found at the local movie theater while Sam is their with her dad and best friend, she knows immediately she will fight to be the lead reporter on this story. I read book 2 first and REALLY enjoyed it much to my surprise, so of course I had to get book 1. This is a middle grade series, but I really enjoy it where usually I don't give middle grade books a chance. Samantha Sanderson is a 7th grader who is a cheerleader and on the school newspaper (She is an aspiring journalist just like her mom). when she catches whim of a bomb at the local movie theater she knows she has to have this story. A big reason I enjoy these books is because each one has a moral or lesson that is important for the younger kids and a big plus is that they are christian novels which can be a little bit harder to find for tweens. This is a fun, fast read, about a high tech cheerleader and her best friend Makayla, as they solve mysteries and report in the school paper. Sam wants to be an international news reporter like her mother, and with a police officer for a father, Sam's in no short supply of writing material. But when Sam shares her theories on the crime in her school paper, her life is in danger too! Don't miss this excellent series for girls ages 9-12. SAMANTHA SANDERSON AT THE MOVIES is for tweeners so my tween daughter reviewed it. It started slow, but it did get better at the end. Most of the story was about a bomb, and trying to find a suspect. This one guy in the story was getting threats. This was a mystery/suspense for young adult readers and if you like that genre you might like this book. As this is the first book in a series I think it is a wonderful start. My children and I enjoyed it immensely. The story is great from start to finish and this author does a wonderful job of expression and presentation. Christian middle school girl who wants to become a reporter like her mom. Samantha is working to uncover the mystery of who placed the bomb at the movie theater. As the town detective, her dad is also working to solve that mystery. This was better than I had expected especially for a middle grade book. However, there were times when it was a bit preachy. This witty, fun-loving tale of Samantha Sanderson on the hunt for clues to solve a mystery is perfect for middle grade girls! Her series is very fun and easy to read, too! Exciting and suspenseful, Samantha Sanderson is dying to get a lead article to write for the school newspaper. Great story with appropriate Christian morals for young girls. My daughter and I read this together. It was very enjoyable! Robin’s passion has always been to tell stories to entertain others and come alongside them on their faith journey—aspects Robin weaves into each of her publ “I love boxing. I love Hallmark movies. I love fishing. I love scrapbooking. Nope, I've never fit into the boxes people have wanted to put me in.” ~Robin Caroll is definitely a contradiction, but one that beckons you to get to know her better.